Click here for April events leading up to Easter Sunday. 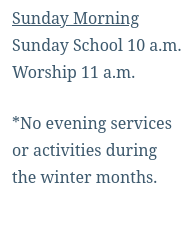 Please note: During the winter months we will be meeting for service on Sunday mornings only. Sunday School will start at 10 a.m. and Worship at 11. Read about our church’s History. Get directions to Find Us. Let me be the first to welcome you to Unity Baptist Church! Perhaps you are looking for a church to visit in person or maybe you have been to a service and are now doing a little research. In either case I will take a moment and share a little about us. As a small country church, we don’t have people directing traffic in the parking lot or a team of greeters to meet you at the front door. But I can promise you this: any visitor will be met and warmly welcomed. Our people will be happy to see you. My wife and I have served at Unity since October of 2014. I cannot write a long list of things our church “has to offer” but our goal is to be the body of Christ in this community. We read and study God’s Word and seek to share the Gospel – Good News – at every available opportunity. Sunday School begins at 10 am and our worship service is at 11. Singing, praying, reading scripture, giving, preaching and the response to preaching are all acts of worship. We have a few special events throughout the year and partner with local churches for others. I don’t shove religion down anybody’s throat; I want to introduce you to Jesus and tell you more about him. And don’t get the wrong idea – we’re still learning as well, myself included. You can read about our beliefs, the church’s history and listen to sermons at this website. Contact me via email pastor@unitybaptist.church or give me a call (770) 608-7005 to schedule a pastoral meeting or discuss any concerns you may have. Don’t be a stranger. Feel free to drop in anytime we are here. Galatians 6:11-18 wraps up our series in Galatians and serves us well as our text for Palm Sunday. Far be it from me to boast except in the cross of our Lord Jesus Christ… Paul exhorts his readers to look past the Law, circumcision, anything that is not becoming a new creation in Christ. For you were called to freedom, brothers. Only do not use your freedom as an opportunity for the flesh, but through love serve one another. (Galatians 5:13) This sermon doesn’t take freedom out of context, like some verse of scripture used to describe an American holiday, but finds it’s place right at the center of Paul’s letter to the Galatians. Easter will be on April 21st this year and we invite you to celebrate the resurrection with us! Here are some events and things to look forward to. Calhoun First United Methodist Church will again host a series of Lenten luncheons during Holy Week, Monday through Thursday at noon with a different speaker each day. This year’s Good Friday service will also be at First UMC. I will be speaking on Isaiah 53, others to follow with Matthew 26 and 27 texts. The Plainville Church of God of Prophecy has an annual Easter Egg Hunt that is open to the public at the Plainville Recreation Department. 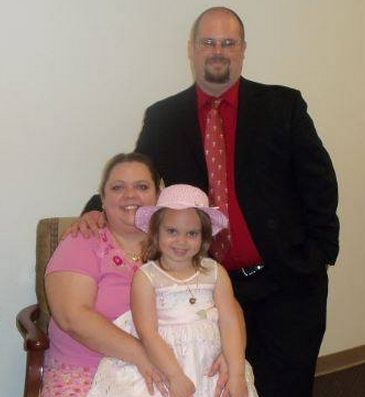 Our family attended last year, Pastor Ronnie Chandler invites everyone in the community. Join us Saturday, March 20 at the Plainville Park on School Street. Details below. Gordon County Christian Ministerial Alliance puts together a community Sunrise Service at BB&T Park in downtown Calhoun. I preached last year, Mark Piotrowski will bring this year’s sermon. Several local pastors will take part. Sunrise Service begins at 7 am and will last 30 to 40 minutes. We will have Sunday School and Worship at Unity at the regular times, 10 and 11 am. Join as we worship the resurrected savior who lives forevermore! At the end of Galatians 4 Paul uses the two sons of Abraham to illustrate the difference between born under the Law and born of promise. He asks those who desire to be under the Law if they have heard the Law. Last week we said that living under the Law is like being kept by a guardian until coming of age. Today we see how Christ redeems us from the Law, allowing us to become children of God (and if children heirs). The sermon text is short but look for excursions into Hebrews 1 and Romans 8. As I’ve said, the theology is thick in the middle of Galatians. The promises made to Abraham were fulfilled in Christ. In the meantime the Law was given, not to make us to righteous but to act as a guardian until it was time to receive the inheritance of faith. The second half of Galatians explores the relationship between Abraham, the Law, the Christ and the inheritance of the faithful. As proof that we are justified by faith and not the Law, Paul asks by how we receive the Spirit. The Galatian Christians had already received the Holy Spirit by faith in Jesus Christ. There is no reason to go back to keeping the Law after receiving the Spirit. The same is true today.